It’s going to be a long road while trying to catch up to the current chapters of Food Wars! in Weekly Shonen Jump, but it’s guaranteed to a be a road filled with cooking battles and boys clad only in aprons. A fantastic follow up to the first volume, Food Wars! Vol 2 by Yuto Tsukuda and Shun Saeki is a shonen manga following Soma, the newest student at a prestigious cooking school that boasts a whopping 10% graduation rate. Only the best of the best survive at Totsuki Culinary Academy. Food Wars! Vol. 2 begins more or less where the first volume left off. [You can find my review for volume 1 here]. Soma is searching for his new residence, Polar Star Dormitory, only to find that the campus is huge and he should really invest in a bicycle. Once he finally reaches the dorms, Soma learns that a cooking test must be passed in order to officially start living there, regardless of the fact that he’s already been told that that’s where he’s staying. But the dormitories aren’t the only place Soma needs to show off his culinary skills. When the Donburi Research Society is threatened with closure and demolition, Soma steps in and partakes in his first official shokugeki match against Ikumi Mito, one of the schools top students. The dorm’s students are few, most of the student body having enough money and acclaim to afford off campus housing. It is an eclectic bunch consisting of many first year students as well a couple of older students. Both the underdogs and the school’s elite live here together, friendly enough with one another to set up a party in order to welcome Soma to their dormitory yet with enough healthy rivalry for Soma and Satoshi Isshiki to have an impromptu cooking competition. Outside of meeting quite a few new students, we learn more information about the school and how it operates. This constitutes much of the first half of the volume. Food Wars! Vol 2 does feel much slower than volume 1 because of this. However, the second half picks up in tempo with the first shokugeki tournament of the series. 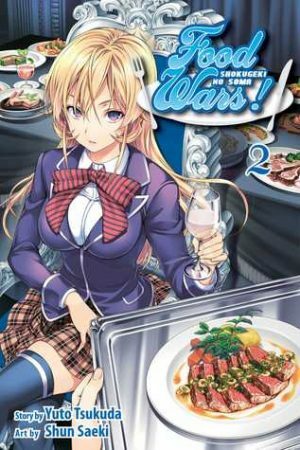 The shokugeki tournament is a high stakes battle in which two opponents have a cook off with priorly agreed upon rules and whose winner is declared by a set of judges. Welcome to traditional shonen battle mode a la cooking school. If this isn’t creative shonen, I’m not sure what is. For the first time in the series we see Soma really working for something. While the dishes he created in volume 1 were not necessarily simple nor the battle easily won, we didn’t see Soma in quite the same light as we do here. Soma certainly put his all into those dishes, yet it never looked like he was struggling. We never had the fear that perhaps the task at hand was just a little above his abilities. This changes within volume 2. The shokugeki tournament against Ikumi Mito is a very real strain on his abilities. For the first time we see him practicing. His friends and fellow schoolmates pull no punches, being very frank that while good, in his current state he simply isn’t good enough. Once again, the art is stunning. The dishes both Soma and the other students make look delicious. And, what’s more, the recipes for the dishes the characters cook are included in the conclusion of each chapter. (I can sense a new series of posts depicting my failed attempts at making these dishes for myself. Fun fact – I can’t make edible rice balls.) The level of detail in the art of Food Wars! always astounds me, and it is always a pleasure to read. Is there a fan service? Yes, there is. But despite the more explicit nature of some images compared to what is found in other equally fan service laden manga, I don’t find it egregious. Perhaps it’s the fact that the fan service is symbolic in a way. Maybe it’s the sheer quality of the art (once an art history student, always an art history student, I suppose). Yet I just don’t find myself rolling my eyes at the fanservice. Here it’s nuanced. It means something. It’s greater than the sum of its parts. It enhances the manga in a lot of ways. Food Wars! Vol. 2 by Yuto Tsukuda and Shun Saeki is a great second volume in the series with fantastic artwork. I will most definitely going to be continuing with this series. Unfortunately, volume 2 seems to be the end of the volumes my local library has collected so a review for volume 3 might take a bit longer to come. If you haven’t checked out this series yet and don’t mind a little fan service, definitely pick up a copy.